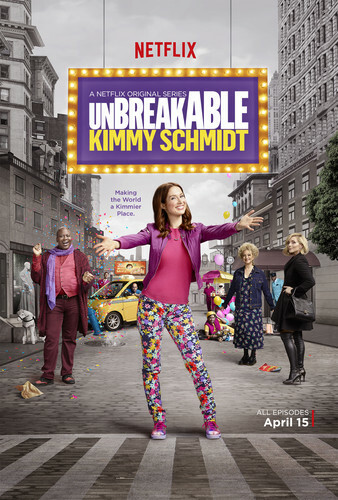 Unbreakable Kimmy Schmidt Poster. Unbreakable Kimmy Schmidt poster featuring Ellie Kemper as Kimmy Schmidt, Tituss Burgess as Titus Andromedon, Carol Kane as Lillian Kaushtupper, and Jane Krakowski as Jacqueline White.. HD Wallpaper and background images in the Unbreakable Kimmy Schmidt club tagged: photo unbreakable kimmy schmidt series netflix season 2 2016 poster promotional ellie kemper kimmy titus burgess titus carol kane lillian jane krakowski jacqueline. This Unbreakable Kimmy Schmidt photo contains jalan, tempat kejadian bandar, tetapan bandar, menetapkan, bandar tempat kejadian jalan perbandaran, and bandar. There might also be pakaian ketat, leotards, dry, lintasan pelican, persimpangan pelican, hip boot, and thigh boot.